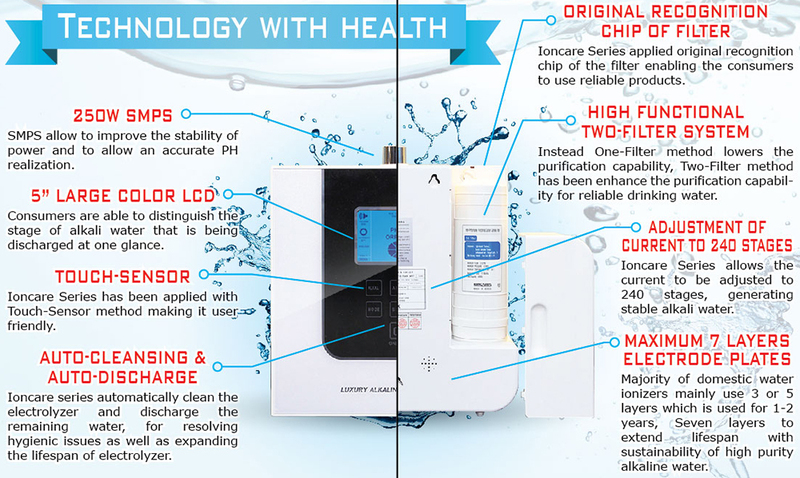 Ioncare series are a household device that generates alkali water, acidic water and purified water as the tap water goes through the purification filter to remove harmful substances and through an electrolysis proces. Alkali water ionizer is a household device verified by the Korean Food and Drug Administration (KFDA) for its efficacy in the improvement in the four majar stomach symptom improvements such as indiges-tion, chronic diarrhea , excessive stomach acid and abnormal fermen-tation in the stomach. It's a device that generates alkaline water with Ph8.5 to 10.0 hrough electrolysis that is helpful in improving major stomach troubles such as chronic diarrhea, in digestion, abnormal fermentation wothin stomach and hyperacidity. 19, Lot 4771, Taman Naga, 71010 Lukut, Negeri Sembilan, Malaysia.